Not Sure What To Do For Valentine's Night,What better way to spend the most romantic night of the year but in the company of your loved one listening to the world's most beloved Tenor singing the world's most romantic songs in the most romantic of settings. 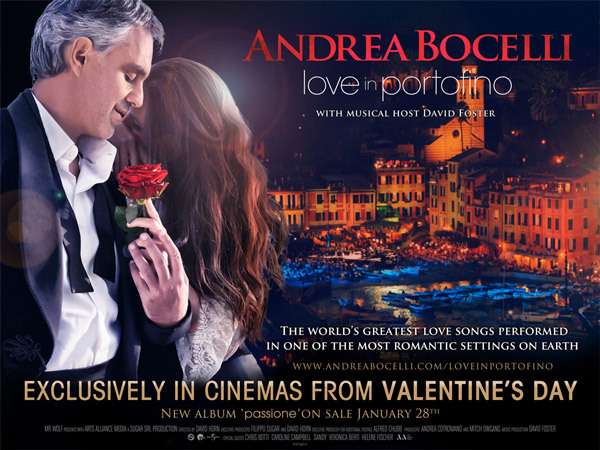 Andrea Bocelli performs the most famous love songs from the Pizzetta in Portofino, Italy. Backed by supporting talent and a 40 piece orchestra. The evening is hosted by multiple Grammy award winner David Foster. The concert is preceded by a rare interview with Bocelli which is exclusive to cinemas.